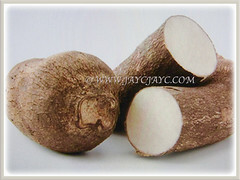 Chinese Yam or Cinnamon Vine produces edible tubers which can measure up to 1 m long and weigh up to 2.5 kilograms. It’s flavourful and nutritious with taste between a sweet potato and a regular potato. Besides, it contains medicinal properties that are essential in promoting good health. 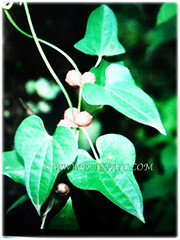 Botanical Name: Dioscorea polystachya (syn. : Dioscorea batatas, Dioscorea potaninii). Common Names: Chinese Yam, Cinnamon Vine, Ubi Keladi in Malay. Etymology:The genus name Dioscorea is named in honour of Pedianus Dioscorides, a Greek physician, pharmacologist and botanist. The specific epithet polystachya is from the Greek words poly meaning many and stachys meaning grain ear. Origin: Native to temperate Asia, namely China, Japan and Korea. It is also cultivated elsewhere around the world. Plant type: An ornamental and perennial vine that produces edible tubers and bulbils. Features: Dioscorea polystachya is from the genus Dioscorea that consists of over 600 species of flowering plants. It is a perennial herbaceous vine with a thick and spindle-shaped or cylindrical underground tuber. Typically, it climbs between 3-5 m long but can be longer. 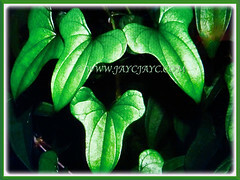 A fast-growing vine with stems twining clockwise and covers quickly any climbing support. The leaves are up to 11 cm long and wide, as well as are held on petioles that are as long as the leaf blades. 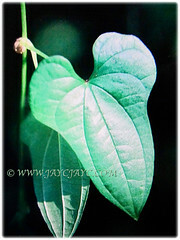 Lower leaves are usually oval to heart-shaped and upper leaves sagittate with 3 lobes. They are lobed at the base and larger ones may have lobed edges. The arrangement is variable, they may be alternately or oppositely arranged or borne in whorls. In the leaf axils appear warty, rounded and small bulbils under 2 cm in diameter. New plants sprout from the bulbils or parts of them. A dioecious plant with female flowers occurring in the leaf axils and in a spike of 3-5 spikes of up to 5 cm long in a zigzag form. Male flowers, up to 5 cm long occur in the leaf axils. The small flowers are cinnamon-scented. 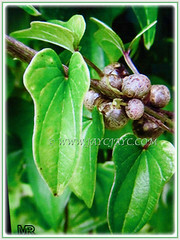 Fruit is a globose capsule, 1.7-2 cm long and 1.5-3 cm wide, containing winged seeds. The largest tuber may weigh 2.5 kg and grow one meter underground. 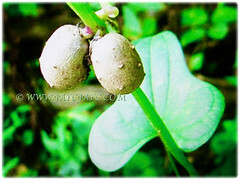 Culture (Care):Dioscorea polystachya or Chinese Yam can be grown easily with least maintenance. Light: Preferably full sun though it tolerates partial shade. Others: If the male and female plants are near each other, remove the fruits before they ripe to avoid distribution by wind. Harvest the tubers during the first year of growth and the bulbils before they ripen and fall to the ground. Generally free from serious pests and diseases. However, watch out for snails and caterpillars. Dioscorea polystachya or Chinese Yam is more tolerant to frost and cooler climates than other yams, which is attributed to its successful introductions and establishment on many continents. A very hardy plant that tolerates down to -20°C easily. 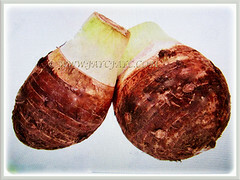 It is cultivated for the consumption of their starchy tubers in many subtropical and temperate regions in the world. Harvest their edible tubers in late summer to early fall and store in a cool and dry place during winter. Tubers can be left in the ground and growth will resume next spring. Propagation: Easily propagated from a tuber by cutting a 15 cm piece from the tip of the tuber. Alternatively, by planting root cuttings. 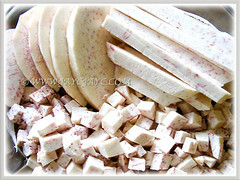 Usage: Dioscorea polystachya or Chinese Yam produces edible tubers and bulbils. Taste is somewhat like potatoes and can be prepared by steaming (especially for nonya yam cakes), frying or baking. 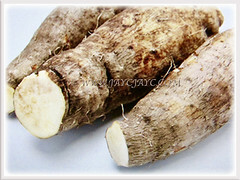 This species of yam is unique as the tubers can be eaten raw. It is frequently planted for its ornamental value whereby the twining vine is attractive for arbors, trellises and along porches. 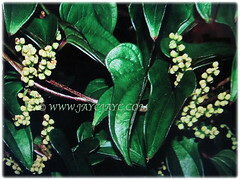 Besides, it has been used traditionally as a contraceptive and in the treatment of various disorders of the genital organs as well as for asthma and arthritis. The tuber is sometimes used as an herbal tonic as it stimulates the stomach and spleen and has an effect on the lungs and kidneys as well as for the treatment of poor appetite, chronic diarrhea, asthma, dry coughs, frequent or uncontrollable urination and diabetes. Its leaf juice can be used to treat snakebites and scorpion stings.